Description Build a layered delta model from well curves and a velocity model. The Delta Model process builds a delta model from well curves. It requires a windowing model (see Creating a Windowing Model) and at least one well with a delta curve. 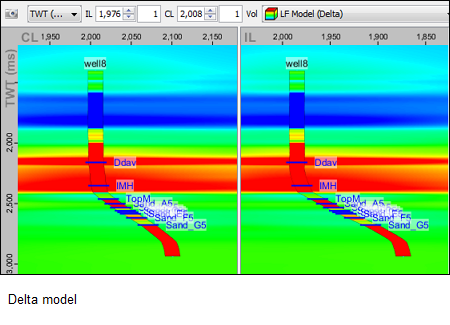 Use Synthetics in Insight to generate delta curves for your wells (see Displaying the Delta Curve). Valid delta curve results must be in the range from -0.25 to 0.35. Window model layers are automatically divided by ghost horizons using the conformability specified in the windowing model. Delta values are selected for the model at the intersection between each well and the ghost layer. These values are combined according to the specified per-layer settings. In the Output Extents section, select a survey to be used in the delta modeling process at Survey. Type the range of Inline extent, Crossline extent and time/depth extent (TWT/TVDSS) for the delta model and the respective sample intervals. 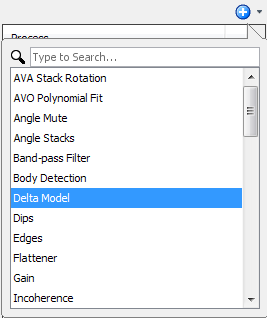 In the Wells section, click the Add Row icon to add the wells used in the delta modeling. Select the delta curve for each well to be used in the delta modeling. 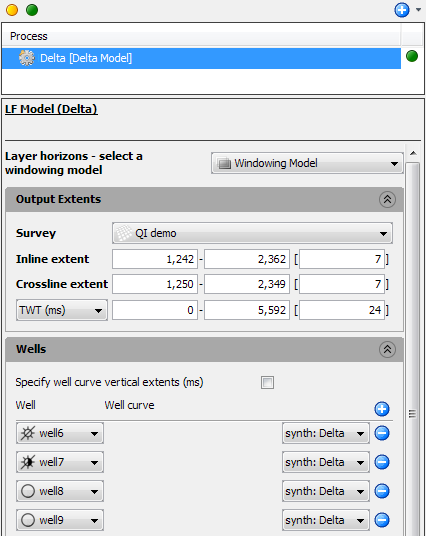 You can use Synthetics in Insight to generate the delta curve for your wells (see Displaying the Delta Curve). Delta values are required to be in the range of -0.25 to 0.35. See "Limiting the vertical extents" section below to include only valid intervals. Enable Specify well curve vertical extents (ms) to set intervals to include in the calculation for each well. You can use this to avoid intervals where the calculated delta value is outside the valid range (-0.25 to 0.35). Average of well values — Calculate delta values based on the average delta values at the wells for each layer within the window model. This generates a model that is constant along XY, for each Z value. User-specified constant — Allows you to type a constant value for the delta model in that layer (this is useful to define sensible delta values outside of the well control depth range; either at depth and/or shallow in the model). As a result of this process, a new delta volume is added in the Volume tab. You can further smooth the delta model using the Volume Smoothing process.